Web traffic has proven elusive for most small to medium sized office products resellers. Many have dabbled with e-commerce efforts but, for the most part they've not been successful. Obviously, there can be no e-commerce without web traffic so, until the office products reseller figures out how to develop relevant web traffic, there will be no e-commerce. In a recent blog we presented a case study for a reseller with $650,000 in sales revenue and a plan to grow that revenue over a four-year period to $950,000 - around 10% compound growth. We emphasized the requirement for a strong value proposition, high levels of customer satisfaction (translating to low churn) and deployment and use of information technology. Our case study also assumed a modern responsive website with high quality, relevant and useful content written for the purposes of educating researching buyers. And finally, that a social and e-mail audience of around 1,000 each had been established, and was ready to be engaged for a digital marketing campaign. A digital inbound strategy is deployed for the purposes of attracting relevant site traffic so, once all the required elements are in place, then it's possible to start down the path toward successful e-commerce and a digital business transformation. 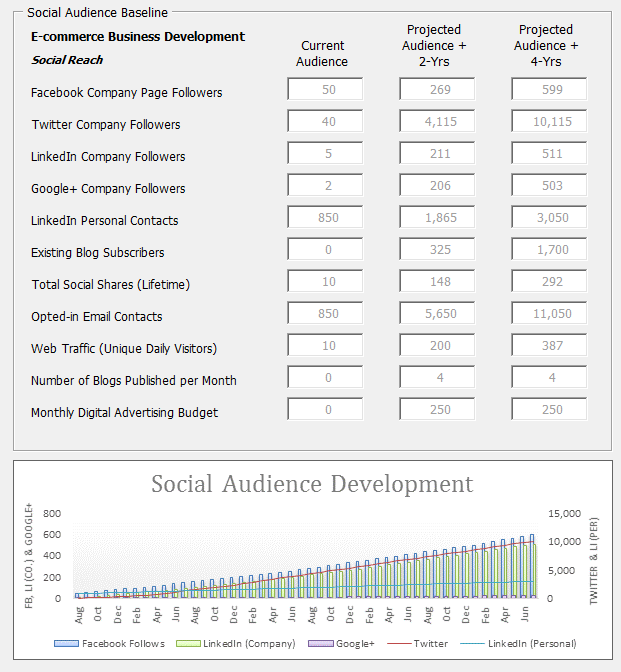 But, what should be planned or expected in terms of web traffic in order to help achieve the business development goals? Firstly, let's assume new customers (at least initially) don't spend as much as existing customers. In our case study example we have $650,000 of annual sales and 150 customers, so the average spend per customer is $4,400. For our new customers, we're going to assume the average spend is only $925 per year - plenty of room for upside! Our revenue growth goal is $285,000 and customer churn is 2.5%. We know we need to develop new sales of $360,000 in order to grow the business from $660,000 to $945,000. The math is simple - $360,000 divided by $925 = 395 new customers. Today the business has 150 customer and it needs just under 400 new customers to achieve its revenue growth target ... ouch! How's that going to happen? 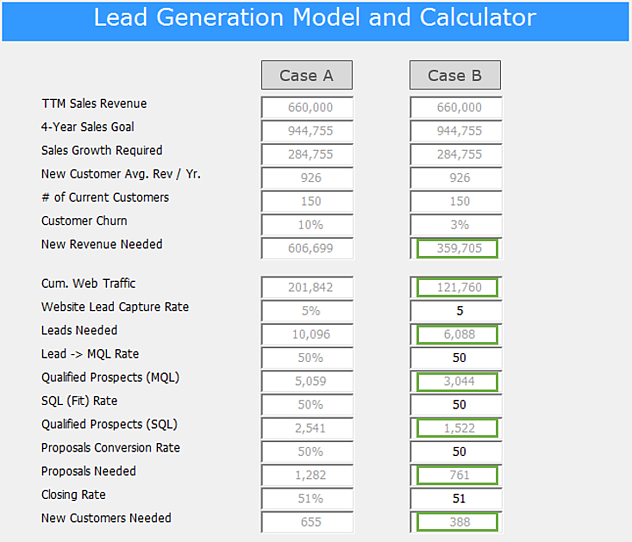 Let's define the sales process and, in so doing, let's explain the sales funnel. 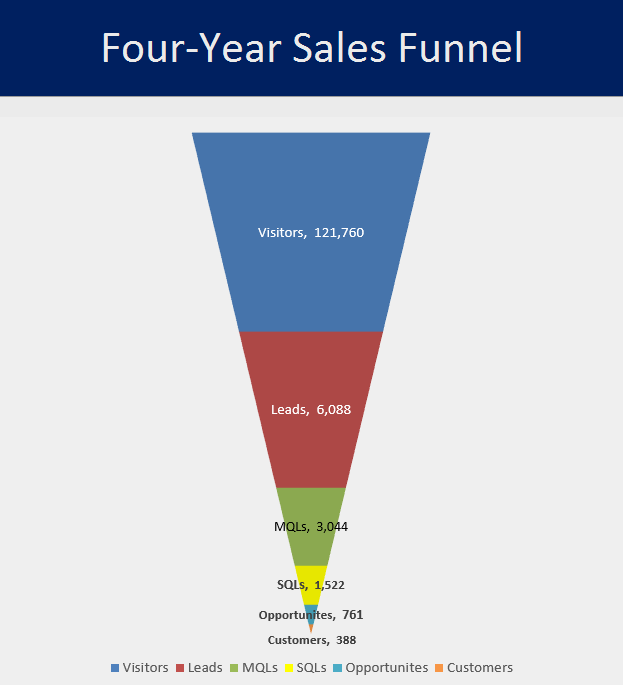 Simply put, the funnel is a visual representation of the steps required to sell a product or service. We know we need just under 400 new customers to achieve our revenue growth goal 4-years from now. So, let's assume a target of 120,000 website visits over that 4-year period - that's an average of 2,500 per month or 85 or so each day. We're not talking millions of website hits here! Having established our 4-year target for 120,000 visitors, now we just need to see what conversion rates are needed through each of the six-steps in the sales pipeline in order to produce 395 customers. Let's say only 5% of the visitors provide their contact details (via a form on your site) and subsequently become a lead. 120,000 x 5% = 6,000 leads. Then, let's assume 50% of the leads are qualified by marketing (3,000) and 50% of those qualified by sales (1,500) and 50% of those are willing to receive a proposal (750) and, finally 50% of those that receive the proposal are closed as customers. 750 x 50% = 375. We've rounded the numbers to keep it simple but, doesn't it seem like what was an "impossible" target of just under 400 new customers may, in fact, be quite achievable? That is, of course, so long as our business is able to attract relevant site traffic and there's a strong value proposition attractive to the target audience! Of course - we're focusing on Case B, but take a quick look at Case A for a timely reminder of the hugely detrimental impact of a 10% churn rate on business development objectives. Instead of needing 120,000 site visitors over 4 years, we'll need 200,000, and, instead of "only" 400 or so new customer we'll need more than 650 to achieve the same results! Churn - don't forget, it's the silent killer! Customer acquisition is hard, web traffic development is hard - it mustn't be thrown away by failing to take care of customers! In digital marketing circles you'll hear over and over - "content is king", and this may be so but, you can't forget the fundamentals of "Business 123" where customer retention is king! Furthermore, don't think you can achieve world-class customer retention unless you're using effective customer relationship management systems. Now, while 120,000 site visits over 4 years may sound like an achievable target - believe me, it's not going to happen unless you have high quality, relevant content that's useful to your target audience. If you decide to launch a campaign using a "sell, sell, sell, sell-at-all-costs" approach then, in our modern digital environment, you will be judged to be "intruding" on your target's time, you will fail to engage, and your audience will strike you off one-by-one! You will of course, fail to achieve your site traffic goals, your lead generation goals and, most probably, your sales revenue goals. In an upcoming blog we'll take a dive into the numbers behind direct email marketing, social media and blogging, and demonstrate how an effective, consistent campaign can generate the traffic volume necessary to achieve planned revenue growth goals. However, just to get you thinking before we publish, we've shown an initial email audience of 850 in the Social Audience Development table above, growing to 11,000 over the 4-year period. Well, two emails per week over that 4-year period adds up to 2.2 million. A 20% open rate and a 10% click-through will generate 44,000 visits, or nearly 40% of the total needed. This is potential traffic from direct email alone, and before accounting for clicks from blogs and social media streams that are also to be key parts of the overall inbound strategy. More on this later! A business transformation path should be emerging from the material we've been publishing - for a free e-Book on the business development opportunities in the Office Products industry please click the link below.